Graphic Design, Branding, Apparel, Print Promotional Items Philadelphia | Maximus Internet Markeing Co.
We are a full service graphic design and printing company specializing in designing, printing, and embroidering for any companies marketing and promotional needs. We are primarily an internet marketing agency, but found that our clients many times still have print needs, we also found that many print companies are very expensive and overcharge their customers, so we started doing these services ourselves to help our clients to save money rather, but still get the great service they need to be successful. Word ended up getting around about our great service and prices and now we do many print and promotional orders, but still keep our discounted pricing to stay affordable for local businesses. We design custom logos, advertisements, banners, and/or anything you would like to put on paper or signage. We can supply you with the art work to print on your own or print them for you no matter how many are needed. We also specialize in coding any art into HTML for email blast, display advertising, or social media campaigns. 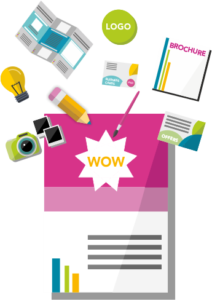 We also offer direct mail services to clients that would like to send out flyers, brochures, menus, postcards, or anything else to their local area of business. We can design the pieces ourselves or you can supply us with them, either way, we will send them out for you into distribution. Pens, stationery, envelopes, letterhead, folders, etc. Call us today so that we can discuss your Print Marketing needs.